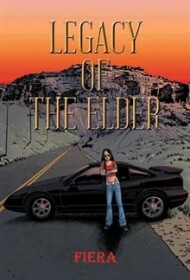 In Legacy of the Elder, author Fiera has accomplished something rare: an original vampire story. The book opens with Fiera (the protagonist shares the author’s single name) in a prison cell. Her early life has been difficult. As the daughter of a ne’er-do-well single mother, she has had frequent brushes with the law. The heroine soon is whisked away by a group of friendly vampires posing as police officers and lawyers. Fiera discovers that she is destined to become the Fire Goddess, the blood heir of The Elder who civilized vampire society. While these vampires have lengthy life spans (up to 10 times normal), regenerative powers and amazing strength and speed, they do not have typical literary vampire traits: no turning into bats, no problems with sunlight or garlic and no Romanian accents. They do, however, speak Esperanto. The author sprinkles in factoids about Esperanto, created in the 19th century as a simple language intended to enable people to understand one another despite their native tongues, though it never caught on. But with Esperanto as the language of vampires, facility with it might be a signal that one is ready to take the plunge. The protagonist immediately falls for one of her vampire protectors, providing romance and not a little angst. What is missing, however, is the horror usually found in vampire novels. In this book, it is vamp against vamp in a hidden underground city in the American Southwest. Normal folks don’t get slaughtered, as one might expect in this type of horror fiction. .
Legacy of the Elder is well written, with effective dialogue, descriptions and characterization. The lead character is lively and fun, and her personality becomes addictive. This book is just a bit different from the hundreds featuring typical vampire fare. It uniqueness may be offputting to some readers of the genre. Many others, however, will find that the story is all the better for it.